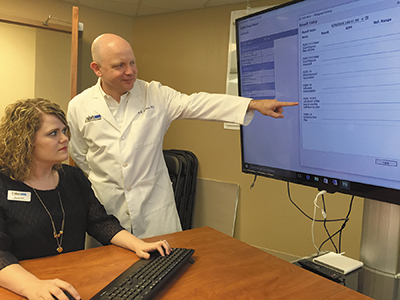 Jason Burrus, MD and Alyssa Hunt study the PQRS dashboard. The Medicare Access and CHIP Reauthorization Act of 2015 (MACRA) means that big changes are coming to healthcare reimbursement; changes that will result in some physicians earning less money and others more. Physicians have to be ready so that they won't be blindsided when the new value-based payment systems take effect. With that in mind, Urology Centers of Alabama is one of the first, and possibly the only, practice in the state to hire someone solely dedicated to preparing the practice physicians to thrive in the new environment. Until recently, Jason Burrus, MD, who is Urology Associates' Medical Director of Operations, was handling all the quality reporting data himself. "Dr. Burrus was seeing patients all day and doing this at night," says David Sorrells, the group's practice administrator. "We needed to find someone to assist him. We found Alyssa Hunt who had been with Northside Medical Associates in Pell City working on their meaningful use and the Physician Quality Reporting System (PQRS). As we began to learn more about MACRA and how much it encompassed, we realized that Alyssa's job would be expanded. Alyssa, along with Heather King, RN, are charged with working with our physicians to make sure we're delivering high-quality, low-cost care." Since her start in May, Alyssa Hunt has been busy. "So far, I've been monitoring meaningful use and PQRS closely because I know that, while those are going away by name, they will still be part of MACRA through the Merit-Based Incentive Payments System (MIPS)," says Hunt whose title is Healthcare Reform Manager. "We've been educating our staff about everything that's coming, stressing the importance of documentation. Also, Dr. Burrus has been a big help because he has the physicians' ear. He is stressing the importance of this to them." While there are two abbreviated reporting options that providers can use in 2017, Hunt's goal is for Urology Centers to report for the entire year. Although the complete list of quality measures for MIPS could change when the final rules come out in November, Urology Centers is currently tracking several of the proposed measures. "We're tracking tobacco cessation," Hunt says. "We have to provide cessation counseling to smokers. We're also making sure that all our patients over 65 are checked for urinary incontinence. And we have to put a care plan in place for those who are incontinent. We're tracking these things now so we can hit the ground running when the final rules are released in January." Urology Centers recently purchased a computer program that should help in the process. It is a PQRS dashboard on the physician's EMR that shows on a daily basis where he or she is standing in the value-based system. "This will make Alyssa's life easier because she won't have to manually accumulate the data," Sorrells says. "She will be able to look at the matrix and if she sees that a doctor is in a bad quadrant, she can drill down into the measures being tracked and find where improvements can be made." Urology Centers is also working with Brookwood Baptist Health (BBH) as part of the Transforming Clinical Practice Initiative which was launched by CMS to create peer-based learning networks designed to assist physician groups in practice transformation. An observer from BBH has been shadowing the front desk to look for ways the practice can improve work flow to save time and see patients quicker. Next he will follow the nursing staff. Hunt hopes that any improvements implemented will help with quality measures. "One of the main things I'm doing," Hunt says, "is to reassure everyone that while this is a big change, it's not as overwhelming as it looks. Once you understand it, it's not too hard to achieve. Practices that are already attesting to meaningful use and PQRS won't have much of a problem at all with MACRA and MIPS. I think people make it out to be a bigger monster than it really is."